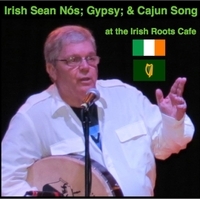 Irish Old Style 'sean nos' songs with a focus on the vocals in English; plus traditional favorites like 'House of the Rising Sun' and Jambalaya (on the bayou); and another lively selection 'Cruiscin Lan' in Irish and English. 4. What Put the Blood on Your Right Shoulder? 1) Irish Song, traditional and sean nos, in Irish and English. Vocalist with the Irish Roots Cafe house band, Mike performed in the first all Irish language stage show in the midwest, and Ranked #1 in the U.S. as a celtic artist on Reverbnation (for nine months). He has had the honor of singing Sean Nós at the annual Gaelic Mass in Kansas City, and currently broadcasts live, streaming audio song shows on the web. Many of his songs are found on YouTube, Vimeo, and iTunes today. Early influences include Joe Heaney of Galway, Cathy Jordon of Dervish, and Niamh Parsons from whom he has taken instruction. Mikes album, 'Irish Song: Traditional and Sean Nós' was placed in the Irish Traditional Music Archives in September, 2013, and named a Top Ten 'Irish Traditional Song Album' for 2013 by Tradconnect out of Dublin, Ireland. Mike founded and co-hosted the 'Hello Fada' podcast, with curious notes on Irish (gaeilge). He also publishes Irish language works, like 'Tribes and Customs of Hy Many'; and 'Hy Fiachrach'. A noted singer in the Irish, Mike gives basic lessons in Sean Nós song. He has taken beginning Irish language instruction in San Antonio, TX; Dublin, OH; and Kansas City. O'Laughlin regularly holds Irish (gaeilge) song events including 'Seachtaine na Gaeilge' in the community, and believes 'old style' song is best learned via oral tradition, by ear, in dialects seldom taught today. Mike descends from OLoughlin of Kilfenora, County Clare, and ODonahue of Glenflesk, County Kerry, with Sullivan, Buckley, Kilmartin, Llewellyn and Kelliher roots. He began leading Irish tours and began an Irish import catalogue in the 80's. He collected a 3,000 volume Irish library during those years. In 2004 he founded the 'Irish Families' DNA project at Familytreedna. A garage band drummer in the 1960s, Mike started a printing company in high school. As a Rockhurst University grad in the 70s, he wrote “The Complete Book for Tracing Your Irish Ancestors”, in the 1980's he was a founder of the Irish American Cultural Center in Kansas City and subsequently founded Irishroots.com and the Irish Roots Cafe. National Public Radio & television; Irish hedge school seminars; Grand Marshall and judge in St. Patricks Day parades; Exhibitor at the Dublin Irish Festival for 20 years; and as a founding member of Irish cultural, bagpipe, and dance groups. A recent streaming show with the Irish Roots Cafe house band, was on Oct. 27, 2013 i on Concertwindow.more... as an author.